STYLE - Add a Touch of Elegance to the Kitchen with Northstar Décor's easy to install Garbage Disposal Air Switch Kit. Northstar Decor provides designer Garbage Disposal Air Switches in a range of styles & finishes to improve the outlook of your kitchen at an affordable price. Available in 24 colors matching any Faucet; our Garbage Disposal Air Kits are made in the United States with an industry leading Two Year Manufacture warranty on the finish. COLOR CHOICES - Available in 24 finishes our collection will cover any of the faucet color combination needs. Our premium finishes includes: Stainless Steel, Polished Chrome, Polished Nickel, Satin Nickel, Polished Brass, Oil-Rubbed Bronze, Antique Copper, Matte Black, Pewter, Satin Chrome, Brushed Bronze, Arctic Stainless Steel, Old World Bronze, Polished Copper, Satin Brass, Tuscan Brass, Venetian Bronze, Weathered Copper, Brushed Nickel, Rustic Bronze, and Champagne Bronze. CONSTRUCTION - Made in the United States, our Round Air Switches are Brass plated (except for White, Bone, Almond-Bone, Biscuit and Glossy Black - refer to color guide for more information). Power Module is UL and cUL approved and is compliant with United States and Canadian standards. 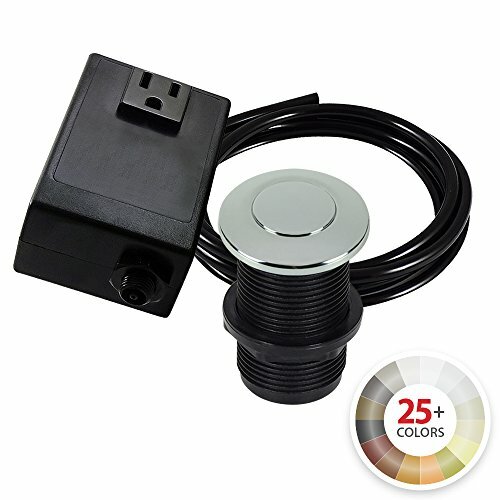 Made for indoor use, the 120V Air Switch can manage Garbage Disposal units of up to 22amps or 1.75 Horsepower.